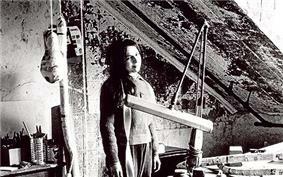 Eva Hesse in her studio in 1965. Eva Hesse (January 11, 1936 – May 29, 1970), was a Jewish German-born American sculptor, known for her pioneering work in materials such as latex, fiberglass, and plastics. She is one of the artists who ushered in the postminimal art movement in the 1960s. Hesse was born into a family of observant Jews in Hamburg, Germany, on January 11, 1936. When Hesse was two years old in December 1938, her parents, hoping to flee from Nazi Germany, sent Eva and her older sister, Helen Hesse Charash, to the Netherlands via Kindertransport. After almost six months of separation, the reunited family moved to England and then, in 1939, emigrated to New York City, where they settled into Manhattan's Washington Heights. In 1944, Hesse's parents separated; her father remarried in 1945 and her mother committed suicide in 1946. In 1962, she met and married sculptor Tom Doyle; they divorced in 1966. In 1969, she was diagnosed with a brain tumor, and she died on Friday, May 29, 1970. Her death, after three operations within a year, at age 34 ended a career spanning only 10 years. Hesse graduated from New York's School of Industrial Art at the age of 16, and in 1952 she enrolled in the Pratt Institute of Design. She dropped out only a year later. Then, from 1954-1957 she studied at Cooper Union and in 1959 she received her BA from Yale University. While at Yale, Eva studied under Josef Albers and was heavily influenced by Abstract Expressionism. After Yale, Eva returned to New York, where she became friends with many other young minimalist artists, including Sol LeWitt, Donald Judd, and others. Her close friendship with Sol LeWitt remained until the end of her life. The two frequently wrote to one another, and in 1965 Sol famously counsels a young doubting Eva to “Stop [thinking] and just DO!” Sol and Eva went on to become two of the most influential artists of the 1960s, and their friendship aided in the artistic development of each of their works. In 1962, Eva married fellow sculptor Tom Doyle, and in 1965, the two moved to Germany so Tom could pursue an artist residency from German industrialist and collector Friedrich Arnhard Scheidt. Hesse and Doyle, whose marriage was coming apart, lived and worked in an abandoned textile mill in the Ruhr region of Germany for about a year. Their studio was set up in a disused part of Friedrich Arnhard Scheidt’s textile factory in Kettwig-on-the-Ruhr near Essen. The building still contained machine parts, tools, and materials from its previous use and the angular forms of these disused machines and tools served as inspiration for Hesse’s mechanical drawings and paintings. Hesse was not happy to be back in Germany, but began sculpting with materials that had been left behind in the abandoned factory. Her first sculpture, a relief titled Ring Around Arosie featured cloth-covered cord, electrical wire, and masonite. This year in Germany marked a turning point in Hesse's career. From this point on she would continue to make sculptures, which became the primary focus in her work. Returning to New York City in 1965, she began working in the materials that would become characteristic of her work: latex, fiberglass, and plastics. From 1968 to until her death in 1970, Hesse taught at the School of Visual Arts, New York, while continuing to make and exhibit her work. Hesse's work often employs multiple forms of similar shape organized together in grid structures or clusters. Retaining some of the defining forms of minimalism, modularity, and unconventional materials, she created eccentric work that was repetitive and labor-intensive. In a statement of her work, Eva describes her piece titled Hang-Up, "It was the first time my idea of absurdity or extreme feeling came through...The whole thing is absolutely rigid, neat cord around the entire thing . . . It is extreme and that is why I like it and don't like it . . . It is the most ridiculous structure that I ever made and that is why it is really good". Arthur C. Danto, "All About Eva", The Nation, July 17/24, 2006, p. 30–34. Posted online June 28, 2006. Lucy R. Lippard, EVA HESSE. 1992 Da Capo Press, Inc. illus. Trade Paper. 251p. SFMOMA | Exhibitions | Exhibition Overview | Eva Hesse (San Francisco Museum of Modern Art February 2, 2002 — May 19, 2002 exhibition). Accessed online 19 September 2006. Sussman, Elisabeth (2006). Eva Hesse Sculpture. New Haven: Yale University Press. Artforum, Summer 1979. Page 6. ^ Encyclopedia of World Biography (2 ed.). Detroit: Gale. 2004. pp. 365–367. ^ SFMOMA exhibit notes, 2002 for Hamburg; Danto 2006, p.32 for family being observant Jews. ^ Vanessa Corby, ''Eva Hesse: Longing, Belonging and Displacement'', pp. 133-137. Books.google.com. Retrieved 2012-04-18. ^ Lippard 1992, p. 6 and in the Chronology: THE ARTIST'S LIFE, p. 218. ^ a b Lippard 1992, p. 6. ^ Encyclopedia of World Biography Vol. 7 (2 ed.). Detroit: Gale. 2004. pp. 365–367. ^ a b c Eva Hesse Solomon R. Guggenheim Museum, New York. ^ a b c Encyclopedia of World Biography Vol. 7 (2 ed.). Detroit: Gale. 2004. pp. 365–367. ^ a b SFMOMA exhibit notes, 2002. ^ Nemser, Cindy (2007). "My Memories of Eva Hesse". Women's Art Journal (Old City Publishing, Inc.) 28 (Spring-Summer): 27. ^ "S+ Stimulant: Sol LeWitt's advice to Eva Hesse". Seymour Magazine. Retrieved 12 April 2015. ^ Mitchell, Samantha. "Converging Lines: Eva Hesse and Sol LeWitt". The Brooklyn Rail Critical Perspectives on Arts, Politics, and Culture. Yale University Press. Retrieved 12 April 2015. ^ Eva Hesse Encyclopedia of World Biographies Vol. 7 (2 ed.). Detroit: Gale. 2004. pp. 365–367. ^ Eva Hesse: Transformations — The Sojourn in Germany 1964/65, 12 June – 24 July 2004 Hauser & Wirth, Zürich. ^ Eva Hesse 1965, 30 January – 9 March 2013 Hauser & Wirth, London. ^ Lippard 1992, p. 24. ^ Eva Hesse, Encyclopedia of World Biographies (2 ed.). Detroit: Gale. 2004. pp. 365–367. ^ Encyclopedia of World Biography. Detroit: Gale. 2004. pp. 365–367. ^ Corby, Vanessa (2010). New Encounters: Arts, Cultures, Concepts : Eva Hesse: Longing, Belonging and Displacement. London: Tauris. p. 12. ^ Corby, Vanessa (2010). New Encounters: Arts, Cultures, Concepts : Eva Hesse: Longing, Belonging, and Displacement. London: Tauris. p. 16. ^ a b c Keats, John. "The Afterlife of Eva Hesse." Art & Antiques Magazine. Art & Antiques Magazine, 31 Mar. 2011. Web. 04 Mar. 2015. ^ Sandler, Irving (1996). Art of The Postmodern Era (first ed.). NY: HarperCollins. p. 29. ^ a b Danto, 2006, p.33. ^ Stoops, Susan (1996). More Than Minimal: Feminism and Abstraction in the 70's. Waltham, MA: Brandeis University. pp. 54–59. ^ Nemser, Cindy (2007). "My Memories of Eva Hesse". Woman's Art Journal (Old City Publishing, Inc.) 28 (1): 27. Retrieved 16 March 2015. ^ Schwabsky, Barry (2010). "Eva Hesse". Artforum (Camden Arts Centre) (April): 205–206. ^ Danto, Arthur (2006). "All About Eva". The Nation 24 (July): 30–33. ^ Fer, Briony (1994). 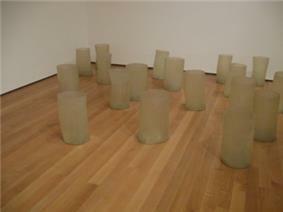 "Bordering on Blank: Eva Hesse and Minimalism" 17 (3). Oxford: Blackwell Publishers. pp. 424–449. ^ Schwabsky, Barry (2010). "Eva Hesse". Artforum (Camden Arts Centre) (April): 206. ^ Johnson, Ellen. "Eva Hesse". Tate Britain. Retrieved 12 April 2015. ^ Danto, Arthur (2006). "All About Eva". The Nation 17 (24): 32. ^ Corby, Vanessa (2010). New Encounters: Arts, Cultures, Concepts : Eva Hesse: Longing, Belonging, and Displacement. London: Tauris. p. 12. ^ a b Danto, 2006, p.30. ^ Lippard 1992, p. 5, 128–129, 138, 180, 182. Art Talk: Conversations with Barbara Hepworth, Sonia Delaunay, Louise Nevelson, Lee Krasner, Alice Neel, Grace Hartigan, Marisol, Eva Hesse, Lila Katzen, Eleanor Antin, Audrey Flack, Nancy Grossman. 1975 New York; Charles Scribner's Sons. 201-224pps. Reprinted Art Talk: Conversations: Conversations with 15 Women Artists. 1995 IconEditions, An Imprint of HarperCollins Publishers. 173-199pps. Eva Hesse. 1976 New York; New York University Press / 1992 Da Capo Press, Inc. Lucy R. Lippard. illus. Trade Paper. 251p. Eva Hesse Sculpture. 1992 Timken Publishers, Inc. Bill Barrette. illus. Trade Paper. 274p. Eva Hesse Paintings, 1960–1964. 1992 Robert Miller Gallery. Max Kozloff. Edited by John Cheim and Nathan Kernan. illus. Trade Cloth. 58p. Four Artists: Robert Ryman, Eva Hesse, Bruce Nauman, Susan Rothenberg. Michael Blackwood Productions, Inc. Color VHS 45 min. Willson, William S., ""Eva Hesse: On the Threshold of Illusions", in :Inside the Visible edited by Catherine de Zegher, MIT Press, 1996. Griselda Pollock with Vanessa Corby (eds. ), Encountering Eva Hesse. London and Munich: Prestel, 2006. According to the Summer 1979 issue of Artforum, three separate iterations of an Eva Hesse retrospective were held, entitled Eva Hesse: Sculpture. These exhibitions took place at the Whitechapel Art Gallery in London from May 4 - June 17, 1979; the Rijksmuseum Kroller-Muller in Otterlo from June 30 - August 5, 1979; and the Kestner-Gesellschaft in Hannover from August 17 - September 23, 1979. One artwork featured in the exhibition was Aught, four double sheets of latex stuffed with polyethylene. Each is 78 x 40 in. In 1961, Hesse’s gouache paintings were exhibited in Brooklyn Museum’s 21st International Watercolor Biennial. Simultaneously, she showed her drawings in the John Heller Gallery exhibition Drawings: Three Young Americans. In August 1962, Eva Hesse and Tom Doyle participated in an Allan Kaprow Happening at the Art Students League of New York in Woodstock, New York. In 1963, Eva Hesse had a one-person show of works on paper at the Allan Stone Gallery on New York's Upper East Side. Her first solo show of sculpture was presented at the Kunstverein für die Rheinlande und Westfalen, Düsseldorf, in 1965. In November 1968, Hesse exhibited her large-scale sculptures at the Fischbach Gallery in New York. This exhibition was titled Chain Polymers and was Hesse's only solo sculpture exhibition during her lifetime. The exhibition was pivotal in Hesse's career, securing her reputation at the time. Her large piece Expanded Expansion showed at the Whitney Museum in the 1969 exhibit "Anti-Illusion: Process/Materials". There have been dozens of major posthumous exhibitions in the United States and Europe, including at The Guggenheim Museum (1972, the San Francisco Museum of Modern Art (2002), The Drawing Center in New York (2006) and the Jewish Museum of New York (2006). In Europe, Eva Hesse had a posthumous exhibition in 2010 at the Fundació Antoni Tàpies in Barcelona. Danto describes her as "cop[ing] with emotional chaos by reinventing sculpture through aesthetic insubordination, playing with worthless material amid the industrial ruins of a defeated nation that, only two decades earlier, would have murdered her without a second thought." Her art is often viewed in light of all the painful struggles of her life including escaping the Nazis, her parents' divorce, the suicide of her mother when she was 10, her failed marriage, and the death of her father. While experiences no doubt had profound impressions on Eva, the true impact of her artwork is in her inventive uses of material, her incredibly contemporary response to the minimalist movement, and her ability to usher in the postmodern and postminimalist art movements. Hesse’s work implements a strict color palette. All of her work, and especially her drawings, are based on repetition and simple progressions.